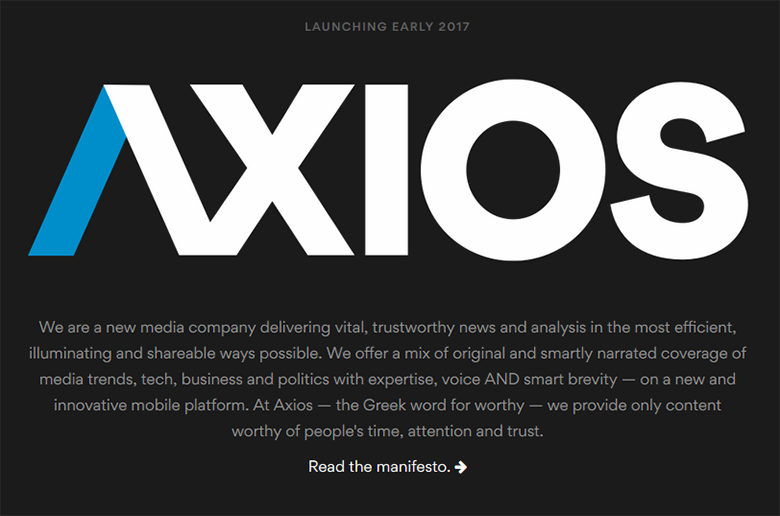 Axios (ä’-ksē-os) is the Greek word for “worthy” and a new media company acquired the domain Axios.com. We researched the background story, and we found some interesting details. Software company Axios Products Inc. was founded 40 years ago, and registered the domain Axios.com in 1997; it continued to create software for mainframe systems over the years. Founded in 1976 and based in Commack, New York, the company’s clientele includes Alticor, Inc.; Economical Mutual Insurance; North American Van Lines; The New York Times; and Wells Fargo Bank. On October 31st, a New York law firm took control of the domain Axios.com, according to DomainTools, indicating that the sale of the domain occurred around that time. The domain’s acquisition was most likely facilitated with the assistance of Mark Daniel, at Domain Holdings. The company Axios Products Inc. continues to operate from the domain AxiosProducts.com. Axios.com is now owned by AXIOS Media, which has emerged in recent months, in order to provide solutions related to the proliferation of fake news, unworthy headlines and to deliver the cleanest, smartest, most efficient and trust-worthy experience for readers and advertisers alike. The AXIOS Media team includes an impressive roster of technology and media industry professionals, from established publications such as Politico, The New York Times, Pinterest, Fortune, The Hill, Bloomberg and others. Co-founders Jim VandeHei, Mike Allen and Roy Schwartz are veterans from Politico. In the summer of 2016, Axios secured $10 million dollars in a round of financing, led by Lerer Hippeau Ventures; backers include NBC News, Emerson Collective, Greycroft Partners, and David and Katherine Bradley, owners of Atlantic Media. Axios / AXIOS Media will focus on business, technology, politics and media trends, engaging the talent of people that are authentically wired and smart in those topics. Launch is slated for late January 2017, very close to the presidential inauguration. For more information visit Axios.com. Poll : Would you donate your expensive domain to a “good cause” ?